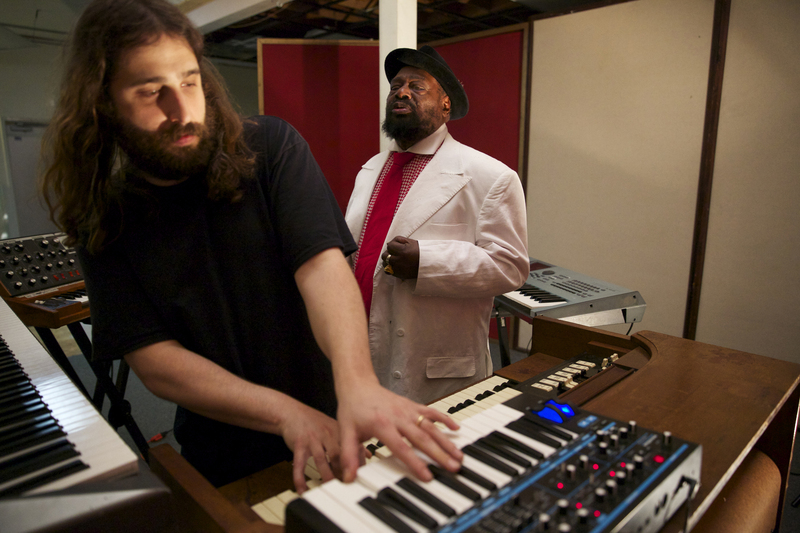 Keyboardist Danny Bedrosian (left) uses Novation Bass Station II in the studio with a member of Parliament-Funkadelic. Los Angeles, CA, June 11, 2014 – Danny Bedrosian has keyboards in the blood. Born into a family of piano teachers, he began lessons at three and a half years old and was classically trained from that point, until age 19. Along with playing lots of choir and gospel music in his pre-teens, he caught the jazz bug at age nine. “I always thought my talent could be applied to any music,” he states. “It’s about communicating and applying your energy to whatever music you’re playing.” As a teenager, Danny was into many different styles of music, "but it wasn't until I got into hip hop that I first became aware of George Clinton and Parliament-Funkadelic, because everyone was sampling their records," he says. By age twelve, Danny's goal in life was to be the keyboards player for the band, and by then he'd also become well-versed in the astonishing history of P-Funk. When he was 16, he had his first encounter with the band: “At his shows in that era, George's stage costume was basically a bedsheet with a hole cut in the middle for his head. In each city the band visited on the tour, there was a competition to design George's bedsheet outfit, and I made one with loads of the band members painted on it. I won the competition and got the chance to meet the band backstage!” Danny had also brought along a recording of his own compositions, which he gave to George Clinton himself. The band was impressed, and as soon as Danny was through the last stages of his formal education, he was invited to become part of the funk, learning the ropes as a technician at first, before moving to George Clinton’s current hometown of Tallahassee, Florida, and obtaining full-time bandmember status. “My first teching gigs were in 2000 and 2001. By May 2004, I was full-time keyboard player for Parliament-Funkadelic. It happened really quickly.” More than a decade later, Danny is still a main member of the band, and has the P-Funk sound honed to perfection. Photo Caption: Keyboardist Danny Bedrosian (left) uses Novation Bass Station II in the studio with a member of Parliament-Funkadelic. Founded in 1992, Novation is often credited for creating the first dedicated MIDI controller: the MM10. The popular Bass Station and Drum Station analogue synths followed this. They were then joined by their first technical director, Chris Huggett, who had worked on the initial products in his spare time: his first big project at Novation was the Supernova, which rapidly became a go-to synthesizer for artists of the time. Success continued with the Nova and SuperNova II. Novation became part of the Focusrite family in August 2004. With the increasing importance of software in the synthesizer field, Novation expanded its range of keyboard controllers and other innovative control surfaces for musicians and producer/performers, fully integrated with powerful software to form the perfect range of gear to play, create and perform music. Novation gear is designed by musicians and producers who use the gear they design every day. That’s why bedroom producers and A-list artists alike use our kit: it’s been designed by and for musicians. And we’re always looking for fresh ideas – so if you have something in mind, get in touch. From studio to stage, Novation frees you to make your music, your way – like never before.